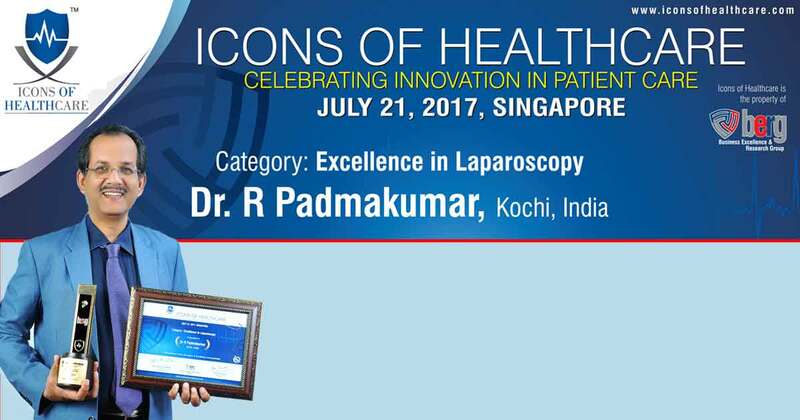 Singapore July 24, 2017: Dr. R. Padmakumar, Senior Consultant Laparoscopic Surgeon, Kochi was recently presented the Award for Excellence in Laparoscopy at the 2nd Icons of Healthcare Summit & Awards in Singapore on July 21, 2017. Dr. R. Padamakumar has undergone training from prestigious institutions - All India Institute of Medical Sciences, New Delhi, Apollo Speciality Hospital, Chennai, and Tata Memorial Hospital, Mumbai, after MBBS from Medical College, Alleppey. Has very good patient numbers treated from world over (at Dubai and India) so far from 28 countries. He is one of the unique surgeon in the world who has performed Endoscopic Thyroid Surgery, Thoracoscopy, and Bariatric surgeries with equal ease and excellent outcome. He was also invited as international visiting specialist surgeon to perform Endoscopic Thyroid surgeries at the prestigious Dubai Hospital by the Dubai Health Authority, a rare honor for a surgeon. Dr. Padmakumar was selected in the list of "100 most powerful Indians in the Gulf", among 40 lakh Indians, holding 28th position for the professional excellence and commitment in obesity and diabetes surgery in 2012. He was also invited as faculty on Obesity Surgery and Laparoscopic Hernia at IASGO 2012 (The 22nd World Congress of the International Association of Surgeons, Gastroenterologists, and Oncologists) held at Bangkok, Thailand. An FRCS from Royal College of Surgeons - Glasgow, Dr Padmakumar has performed more than 6000 hernia surgeries laparoscopically and has trained more than 200 surgeons in the procedure. He is also the first to start diabetic surgery in the state for non-obese category (5th in the world) and perform scarless bariatric surgery with abdominoplasty.